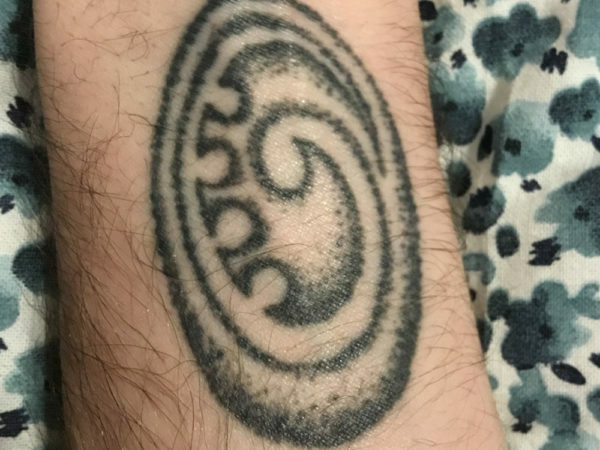 Are you from Bristol and do you have tattoos? Do they tell an interesting story, represent a significant moment in your life or do they just look incredible? 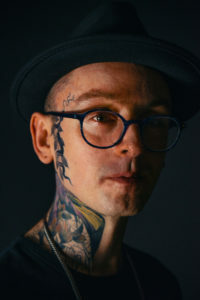 Next year at M Shed we’re opening an exhibition called Tattoo: British Tattoo Art Revealed. 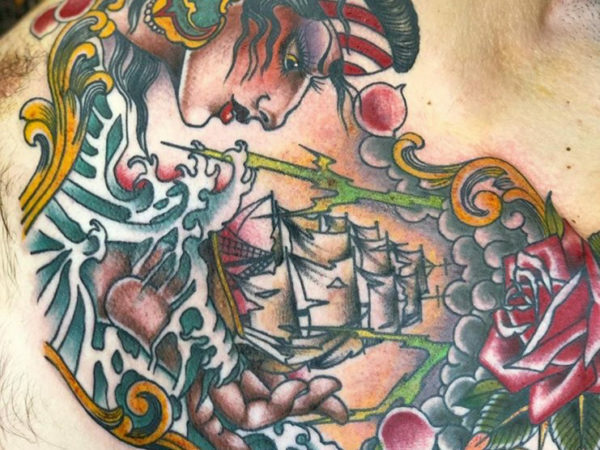 It’s a ground-breaking and comprehensive history of British tattooing. 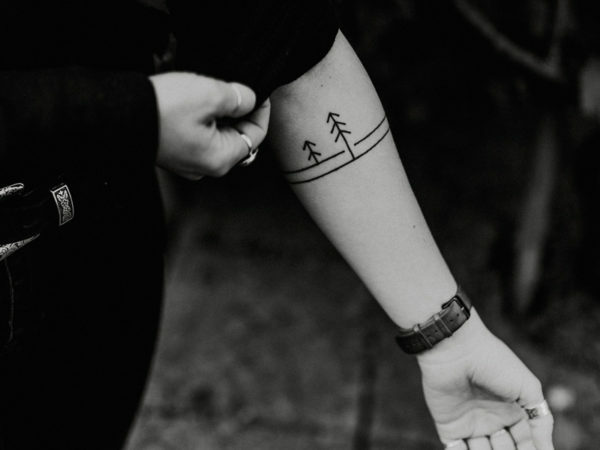 We’d like to talk to you about your experiences and hear the stories of your tattoos. We may use the content you provide on our social media channels and some of the most interesting tales will be selected for inclusion in the exhibition itself. 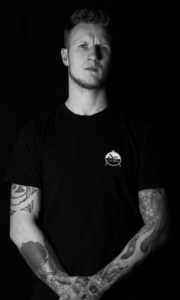 Your involvement will help make our exhibition truly representative of Bristol’s rich tattoo culture. To participate, please fill in and submit the form below along with some good quality images of your tattoo. What area of Bristol do you live in? What’s the story behind it? Would you like to tell us anything else about it? You can upload up to five images, up to 5MB each. 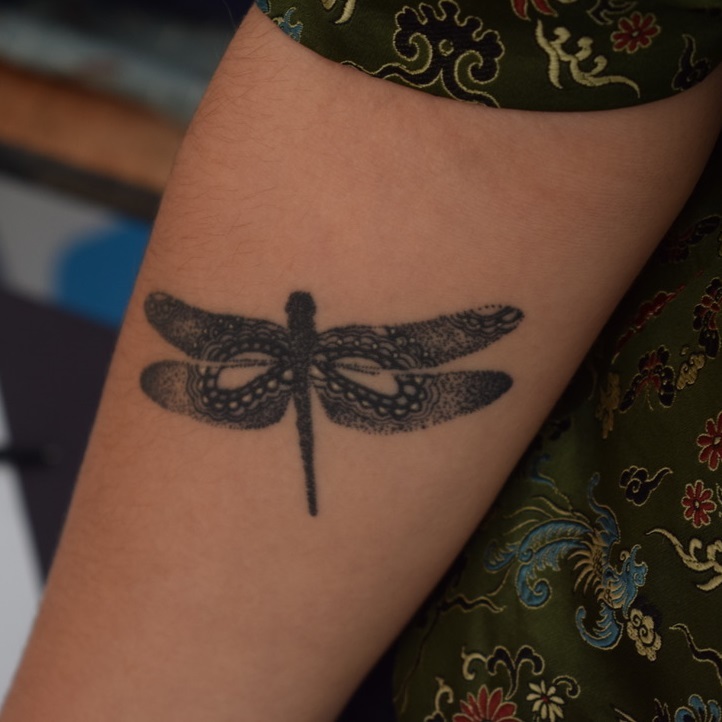 Would you be happy for us to contact you if we want to film you talking about your tattoo for the exhibition? We may use your story and image(s) in the exhibition. By clicking 'submit' you are confirming that you have read and agree to the terms and conditions. With any submission you retain ownership in your submission, but by making a submission you give Bristol Culture, and those authorized by Bristol Culture, your irrevocable perpetual permission to disseminate, modify, and use your submission, in whole or in part, in all media now known or later developed, for standard museum purposes. All submissions must comply with our rules for submission. Any images submitted must be your own/you are the owner of the copyright. By submitting an image to Bristol Culture you are confirming that you are the legal copyright holder. 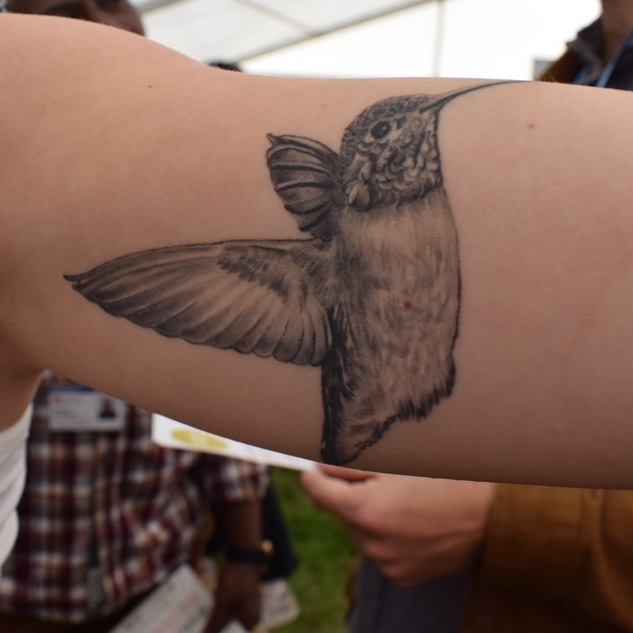 My mum is Australian and in our garden there we always see hummingbirds flying about, so it’s a reminder of family and home. I also thought it would look cool! In 2010 it was discovered that a tumour was occupying my brain, after it was promptly and successfully removed, my intensive rehabilitation begun. At the very end of 2012 I was exploring New Zealand in a successful attempt to regain my independence. I was helping set up a 10 day festival in New Zealand, for the symbolic 21/12/12, Christmas and the new year. At the beginning of my stay on site (about 1 week before the festival began) I noticed a carving of a koru. It stunned me and I just stared into it for a while. Being very interested in the design I asked one of the residents if they knew its meaning and was told that it symbolised “the inner journey”. Which I felt I was particularly on, and have continued to feel that way. In that moment of first discovering its meaning I knew that I wanted it as a tattoo so upon my return to the UK I visited my friend Jon, who as long as I have known has been involved in art and tattoos. 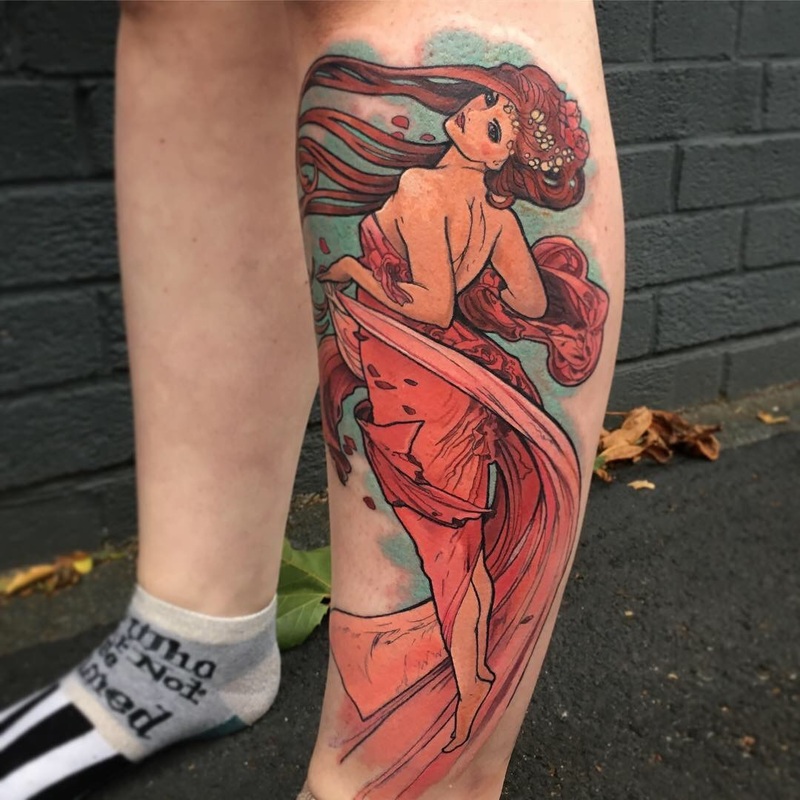 He was very keen on the design and had his own ideas connected to it, but we were both too busy to arrange a date before my wedding so he painted the design and gave us it as a wedding present with the intention of doing it as a tattoo when appropriate. So within the next year we met up and did the tattoo on the Isle of Wight. Often when I gaze at the tattoo thinking of its meaning, I reflect and ponder on my life. It means lots of different little things to me. 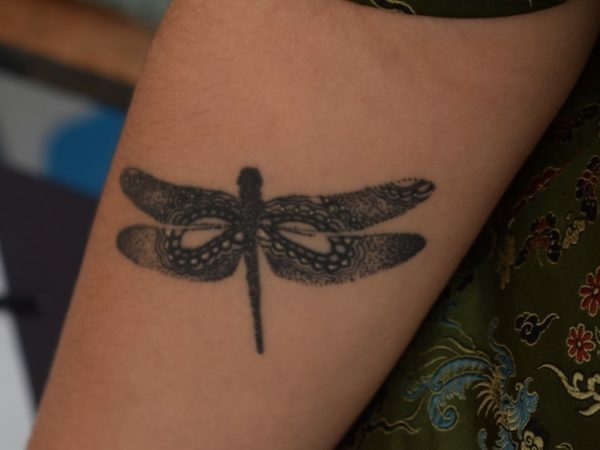 Dragonflies are a symbol of transformation and this was really relevant to me at the time, there was a lot of change going on in my life. It also makes me think of certain happy places and memories as a child. 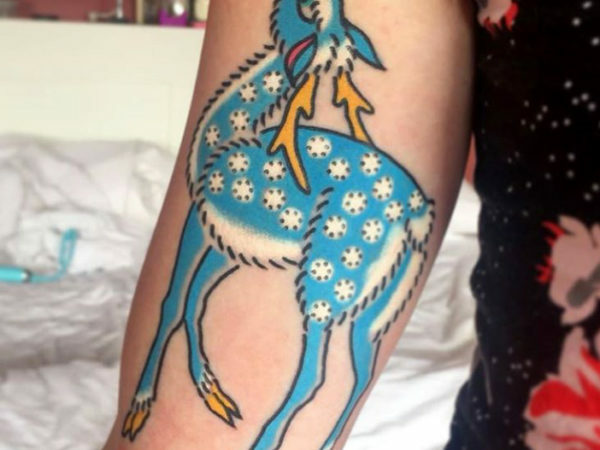 I got my Korean folk art style deer with his nose in the air in London at Good Times Tattoo, September 2018. 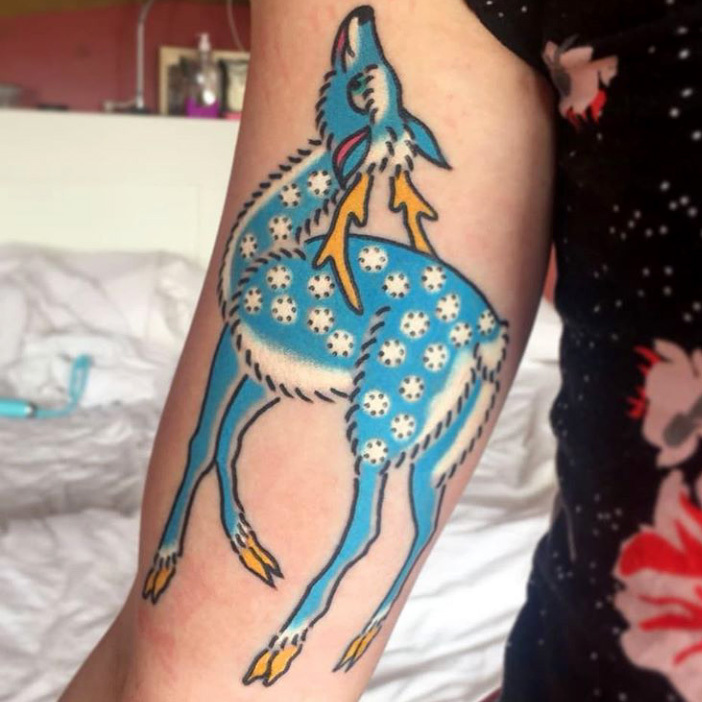 I’d wanted to get a deer for ages, they’re an important symbol in so many cultures and particularly ancient Greek culture. Deer are associated with the goddess Artemis, who, as well as being the goddess of the hunt, is seen as the protector of young girls. As a feminist, this stood out to me. I wanted to make it blue purely so it would be a bit more unique to me! 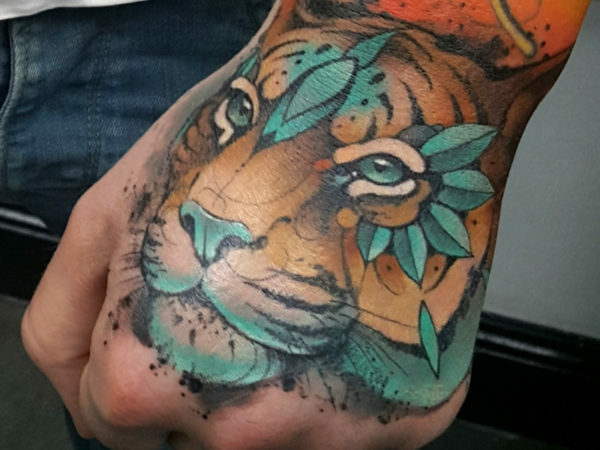 On my hands I have a bear and a tiger at Overlook tattoo in Bournemouth. 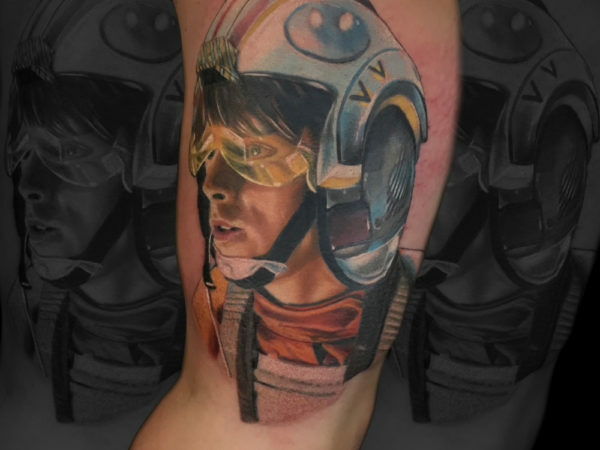 For me personally, most of the tattoos I have are because I love the artwork. Most of them have been done by the same artist – I just give him a vague idea and let him use his artistic license to create something amazing (I think, at least!). 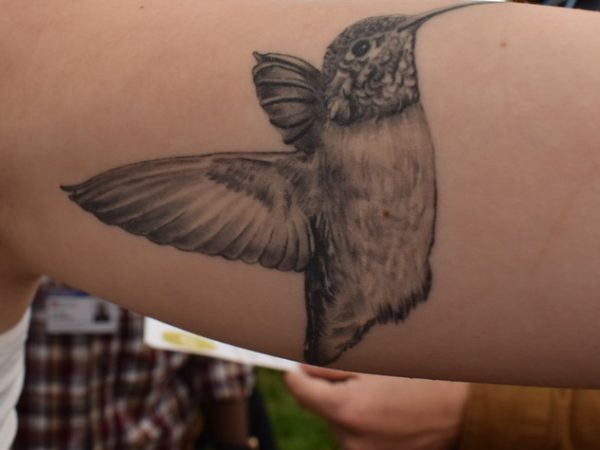 I don’t think someone should be judged just because they want a tattoo – I don’t think it has mean anything, just appreciate the artwork! 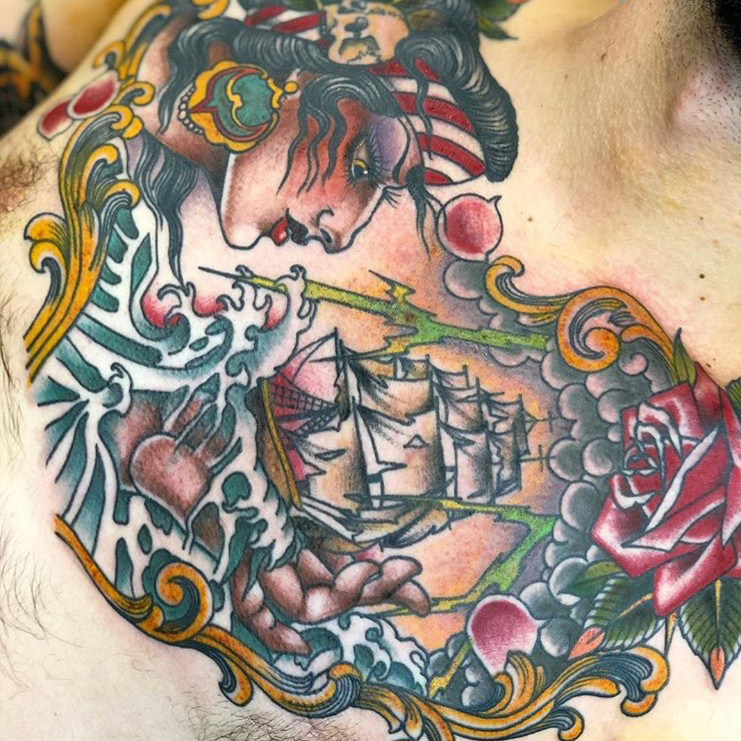 I’ve done them mainly in Modern Classic Tattoo (London), but I’ve had tattoos done in all corners of the world from Switzerland to New York, Alemria to Cartagena. My history with tattoos started when I was doing my Nursing degree in Spain, I went for my first training in the hospital and my mentor had a lot of tattoos. When I’ve saw them I wanted to have the same skin, so I was talking to her during my training about it and I wanted to go to the same artist as her, and she told me the artist’s name: Valerie Vargas.
. One really memorable experience was in Thailand, when had my tattoo done with bamboo (a mandala and the symbol of the Chang Beer). I’ve had tattoos done in all corners of the world, from Switzerland to New York, Alemria to Cartagena. My tattoos symbolises the father-daughter bond I shared with my Dad. He taught me how to be fiercly independent, imaginative, passionate, creative and driven. All of those qualities are underpinned by an honest, loyal and caring spirit. He taught me how to DIY, drive a car and use a film camera. I owe almost everything to him and after he died March 2018, I wanted to carry a visual representation of what he means to me, with me forever. I have other more traditional pieces on me but this one has the most meaningful. 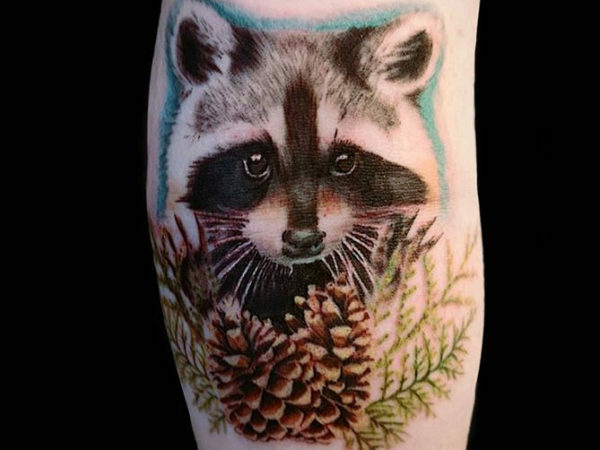 MY tattoo is of Meeko, a raccoon that I have the the privilege to volunteer with at Bristol Zoo Gardens. and i got him done by the amazing Jodie Young at Black Moon Tattoo in Frome. Since finishing my A Levels in 2014, I honestly had absolutely no idea what I wanted to do in life. I’ve always been fascinated with animals and the natural world, so in 2017 I applied to volunteer at Bristol Zoo Gardens, an opportunity that has given me the amazing experience of working alongside many different species, including Meeko the raccoon and his brother Rocky! Volunteering at the zoo has led to me discovering that my dream career is zookeeping and I have begun studying a diploma in Zoological Management to hopefully find a job in the field. 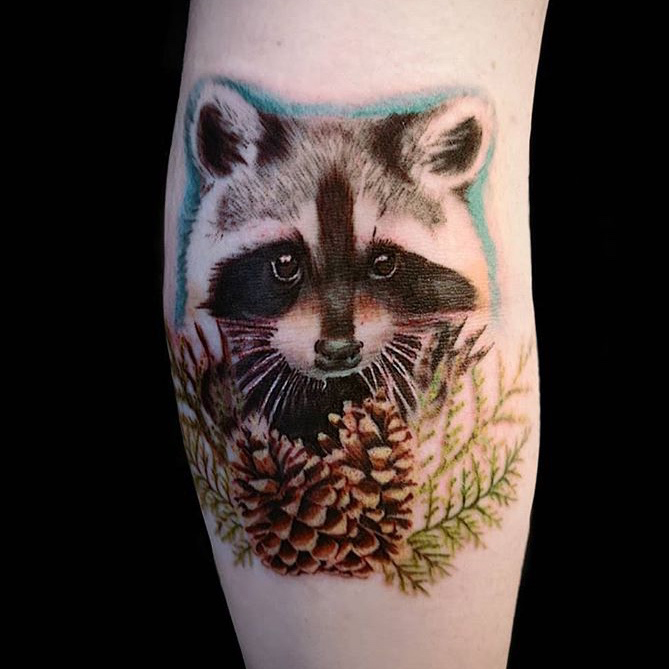 I wanted something to serve as a constant reminder of not only my love for Meeko and the natural world, but also something that would show how far I have come in my journey towards finding my purpose in life. 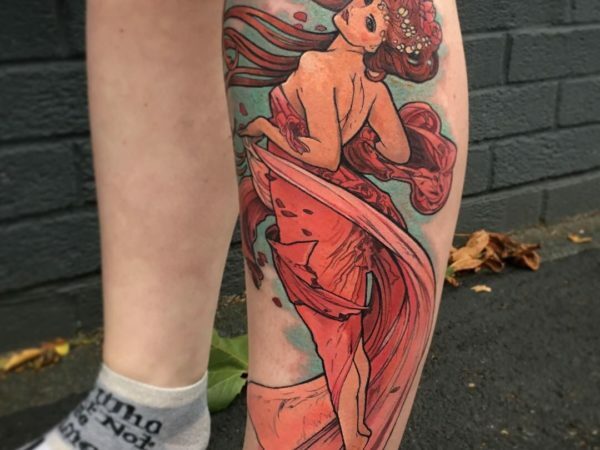 I got my tattoo done in March 2018, Kat Winifred’s studios, Bradley Stoke. I adore nature, gardening and the natural world. Every day I walk my dogs in Nightingale Valley in St Anne’s, Bristol. No matter how rubbish the weather or my mood I never feel bad after I’ve been for a walk. Theres a large clump of Dryopteris filix-mas by the brook that flows through the valley. Every day I’d look at it and every day it’d cheer me up. I took a photo of it and emailed it to a tattoo artist, Kat Winifred, who’d done some work on my friend Vicki. 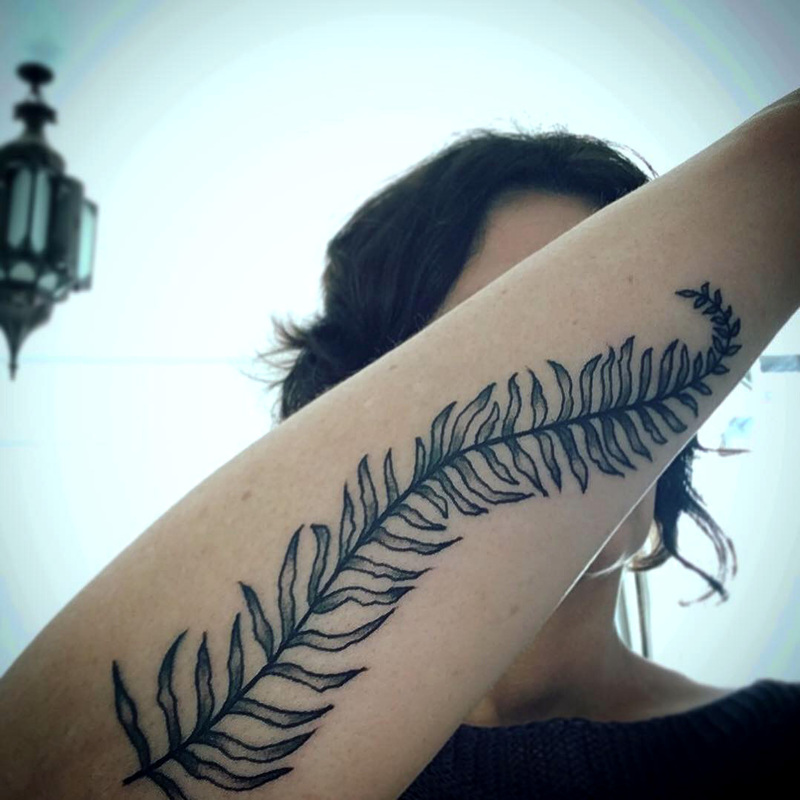 I asked her if she’d draw me a fern from the picture. Kat appealed to me as she loves nature and being outside. My friend Vicki said she was also something of a white-witch which slightly made me chuckle as I wondered how many of them there are in Bradley Stoke?! 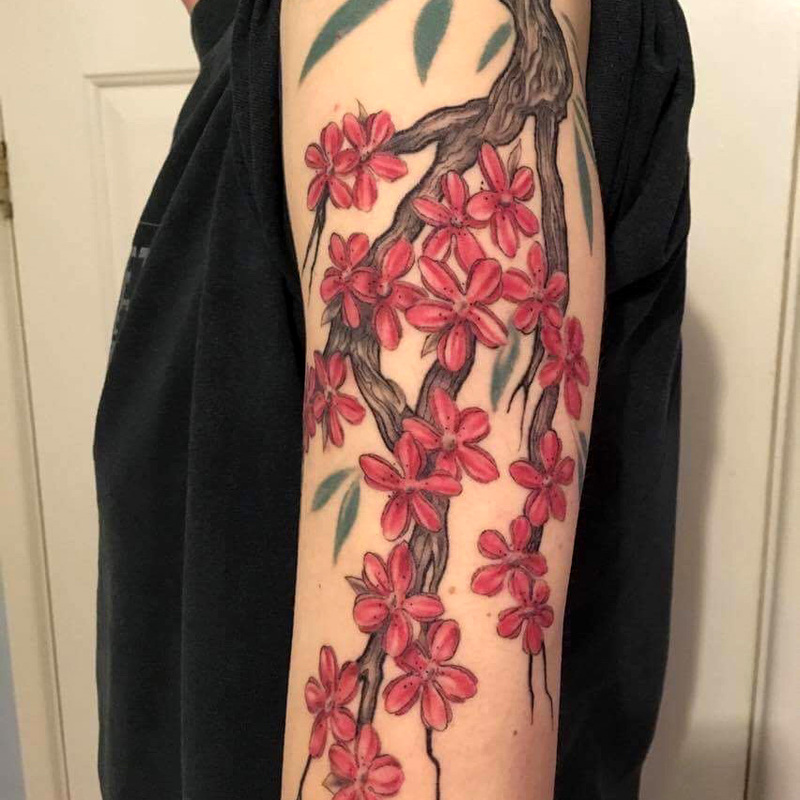 It joined 2 other botanical tattoos – a wisteria flower down my back and a sweet pea shoot up my other forearm. They make me smile every day. I spent a few years living and working in Japan. 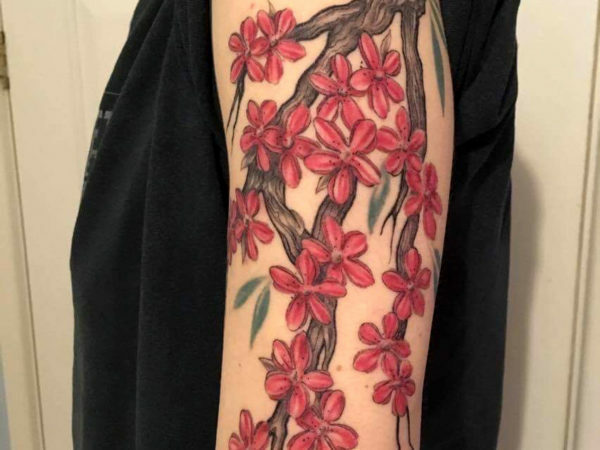 I loved it there, and of course cherry blossom is one of the iconic images of the country, so the design is a memento of one of the happiest times of my life. 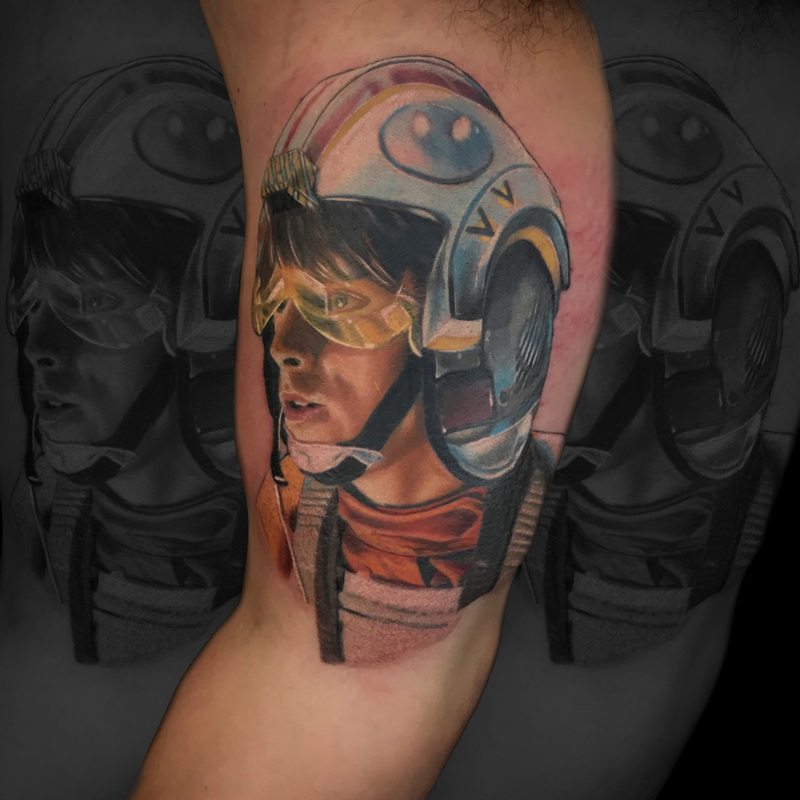 When I tattoo I go through a rollercoaster of emotions and feelings. I get excited, anxious, and I’m extremely happy that my customers have confidence in me to do their tattoo. 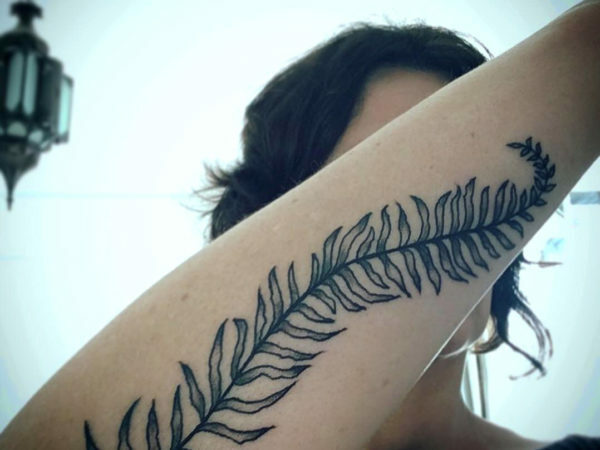 Is there a particular tattoo style or specialty you are drawn to and why? 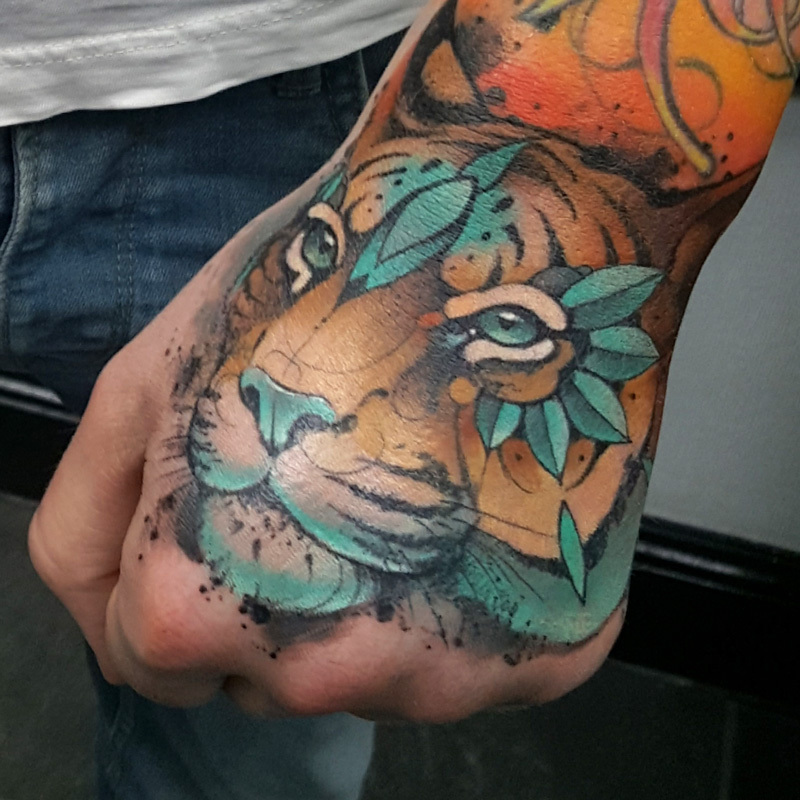 The majority of my customers come to me for realism, black and grey or colour. I really enjoy doing portraits and thrive off the pressure of getting it done correctly. One of my customers messaged me to say she was going to be appearing on the tattoo program “Tattoo Fixers”. I tuned in to watch anxiously thinking she had the tattoo I did covered up. When she walked into the tattoo fixers’ waiting room they asked her to reveal the tattoo she wanted covered and as she lifted up her dress it revealed the portrait of TuPac that I had done. The artists on the show were shocked and said there’s no way she wanted that covered up? Then she lifted her dress slightly higher to show them the small tattoo of an eye that she actually want covered. I feel very focused, as there are no mistakes allowed. Imperfections are essential part of the tattoo, they give it character, but you have to be very skilled nonetheless and of course trust yourself. 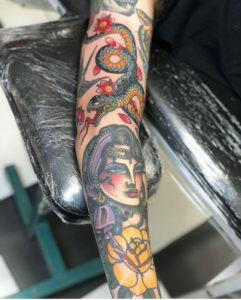 The most satisfying tattoos are the result of a huge amount of trust from our clients, so I always strive to do my best and to create the space where they can have the best possible experience. I’m fascinated by Japanese style of tattooing. 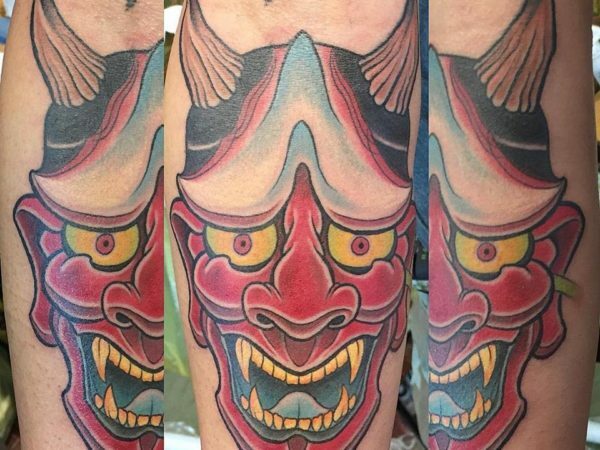 It’s called irezumi or hormone, and it’s largely based on woodblock prints (ukiyo-e, which means “floating world”) from the Edo period of Japanese history. What inspires me in that style is the ability to transform one’s body into whole new “bodysuit”. The balance and harmony in Japanese tattoos are based on principles of Zen Buddhism. One of the most touching moments of my career was when I was asked to design and tattoo a back piece for a customer who was diagnosed with a brain tumour. He wanted me to incorporate the zodiac signs of his family, to have them close to him in case he wouldn’t survive the illness. Going through the process of tattooing that piece was a very humbling experience, I felt that what I do can make a real difference in someone’s life. I feel fully immersed in the act of tattooing. It is the only time my brain, which is prone to wandering, can focus on anything for long amounts of time. I find it both incredibly difficult but also therapeutic. There is no space to think about idle, unimportant fleeting thoughts when you are responsible for permanent art on someone’s body. 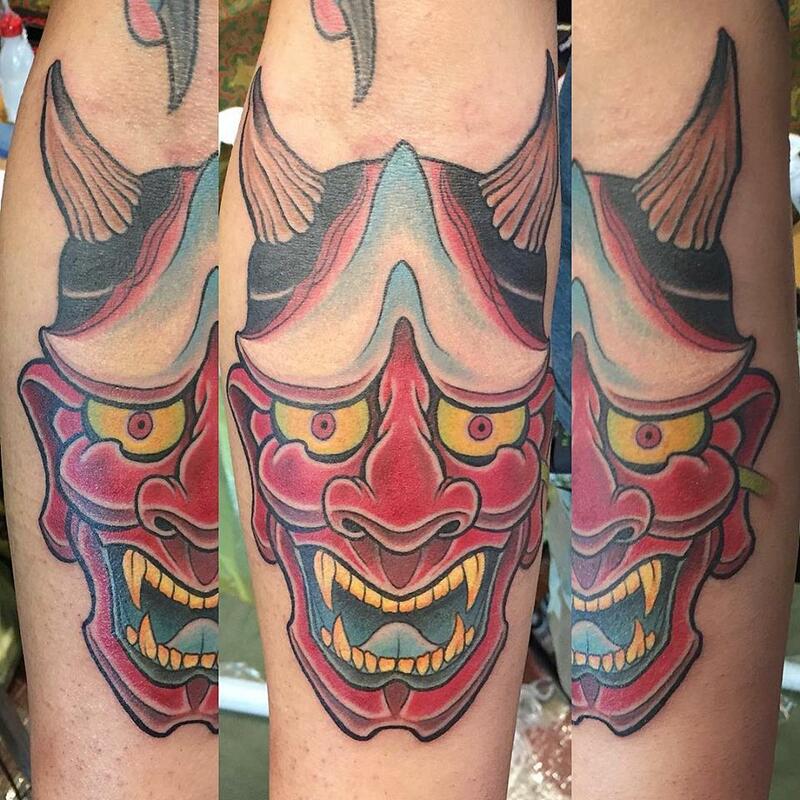 I like a mixture of all styles, I find illustrative and neo-traditional style to be my favourite. I don’t think the story I’m thinking of is suitable for the general public… but I will say that tattooing has led me to meet some of the most amazing, kind, strange and incredible people I’ve ever had the fortune to meet. I’ve met all my best friends through it and had some amazing adventures around the world. If you would like to hear some of the funny/mortifying stories tattooing over the years has given me, pop down to the studio for a chat! I feel super happy that I can do what I love, that I can give someone a piece of my art and they can keep it forever. Blackwork, geometry. My brain works in an ocd way, in geometry everything is about symmetry. It’s just an amazing feeling to mix it together. 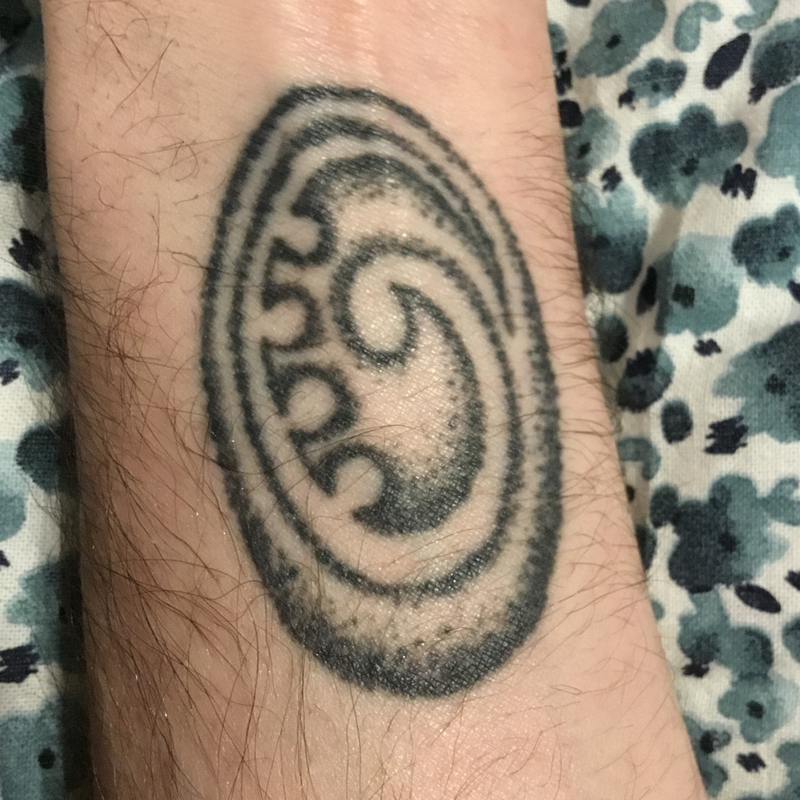 When the lady asked me at the end of tattoo – so how long does it last for? 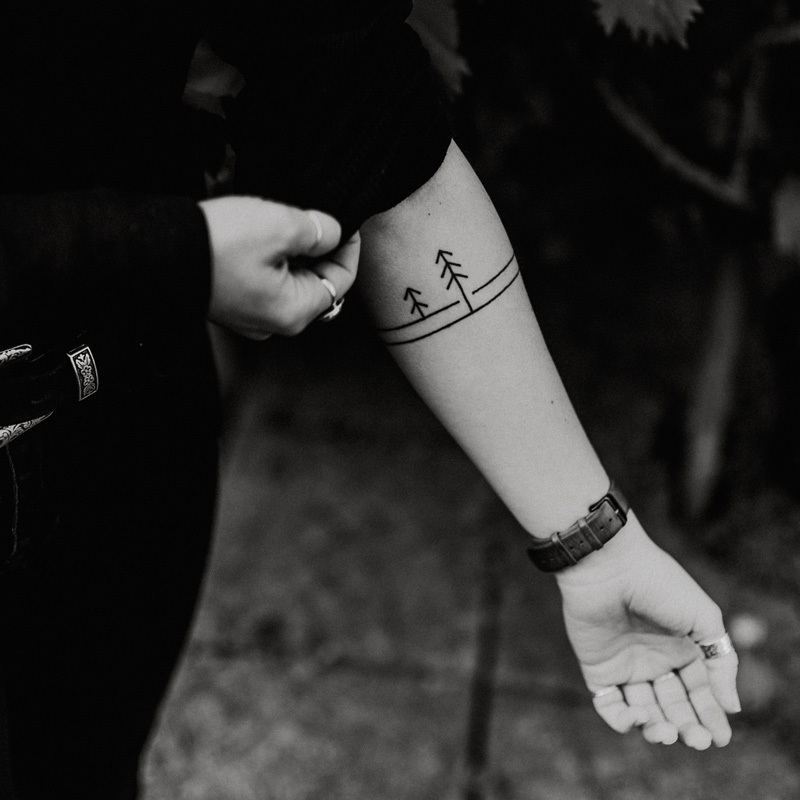 And when I answered – it’s a tattoo , it’s forever, she started panicking.